The first photographs required very long exposure times. This meant that subjects had to remain very still while photos were being taken to avoid appearing blurry in the photo. New developments in the late 1800’s made it possible to take photos with much shorter exposure times. Eadweard Muybridge (1830-1904) was one of the first photographers to take advantage of this, capturing sequences of photos of actions such as horses running, women dancing, and children jumping. 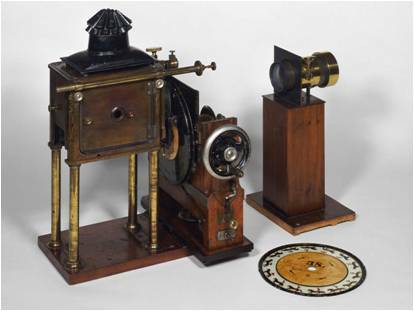 In 1879, Muybridge invented the zoopraxiscope (shown on the right) to project his image sequences. In Greek, "zoopraxiscope" means "animal action viewer." 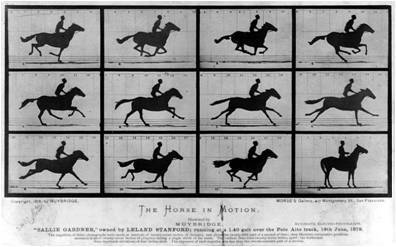 Muybridge, Eadweard. The Horse in Motion – 1878. Wikimedia Commons. Accessed: 22 July 2010. Muybridge’s Zoopraxiscope, © Kingston Museum and Heritage Service. Accessed: 22 July 2010.